Industrial gear units and geared motors from SEW-Eurodrive South Africa are ideal for demanding applications such as agitators, mixers and aerators. Local OEM, Wamechsi Group has standardised on SEW products for a range of wastewater treatment plants it has built throughout the country. This is largely due to the quality and reliability of the SEW technology. The OEM manufactures a range of mechanical equipment for the various stages of the treatment process at a wastewater treatment plant, ranging from mechanical screens to washers and screw presses that wash and compact the material to be removed. Ancillary mechanical equipment includes screw pumps, surface aerators and clarifiers. The biological aspect of the treatment process results in sludge that is processed further by digesters. The final stage of the treatment process involves removing the sludge with dewatering machines. Manufacturing equipment for thickening and dewatering applications is a particular area of expertise for Wamechsi. Established in 1997, the company has transformed into the largest OEM of its kind in South Africa. Its extensive manufacturing capability includes state-of-the-art laser and plasma cutting, CNC lathes and milling machines, submerged-arc and robotic welding, and ancillary equipment such as 24 five ton overhead cranes. The OEM acquired its first SEW products in 2012, in a long-standing partnership predicated on good design, reliability, quality and excellent aftermarket support and service. The OEM’s latest projects to feature SEW products are Virginia Phase Two (six 75 kW industrial gear units specifically for aerators), an additional 22 geared motors for Theronia, and 15 geared motors for mixers at Buschkoppies. Phase One of the Virginia project has already been completed, while Phase Two is being commissioned. “The main reason that we have been so successful in this industry to date is largely due to our innovation and SEW’s reliable product range,” explains Wamechsi CEO, Jurie Niemand. SEW sales representative, Willem Strydom adds that SEW’s extensive experience and track record in the wastewater treatment industry means the company is able to offer flexible and highly reliable total solutions. It is a leading manufacturer of industrial gear units and geared motors, as well as a large range of optional equipment, which ensures reliable drive solutions for the wastewater treatment industry. 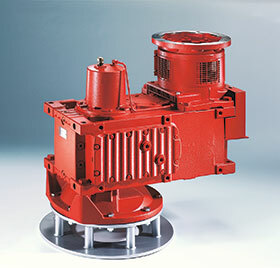 Industrial gear units from SEW are ideal for applications where a high performance level is required for mixing and agitating liquid or paste-type substances. Apart from wastewater treatment, they also include applications in the chemicals, food and beverage, and mining industries. “With aerator and mixing applications, our projects and engineering teams have to double check all of the loads and bending moments. These loads are supplied to us by the client, based on their designs. We then ensure that the gearboxes selected are suited to the application at hand,” Strydom continues. This goes hand in hand with commissioning and maintenance support as required. SEW employs a special program designed specifically to determine if the gearbox selection is adequate, based on the loads and bending moments. This is particularly important when it comes to aerators and mixers. SEW therefore selects the optimal gearbox for the application at hand. A major challenge in this regard is that South Africa is classified officially as a water stressed country, which means that this valuable resource has to be conserved as much as possible. “We are now busy with projects where final effluent is being treated to become potable water. Therefore it is critical for our major component suppliers like SEW to be at the cutting edge of technology,” Niemand explains. “The wastewater treatment industry not only generates much needed employment, but is essential for continued economic development, as the country’s residential needs cannot be met without this essential enabling infrastructure being put in place first,” he concludes.